Every week during the season, a few famous players’ concussions attract attention. They are attended by expert medical teams. Every week during the season, many youth and high school players suffer head injuries in silence because they don’t believe that a “ding” is a real injury, or they don’t want to “let the team down,” or the coach shrugs it off, or the parents don’t realize the medical or academic consequences. This book could change all that. Carla McClafferty has written an excellent survey in a format accessible to a broad age spectrum of football players, their families, fans and youth football volunteers. With an extensive selection of heavily captioned illustrations and photos, and featuring short, punchy chapters the author presents a balanced view of the epic story of American football’s 1905 head injury crisis and the hidden, functional brain injuries underestimated and misunderstood until modern scientific methods began to reveal the truth in the 21st century. The colorful historical tale fills about one-third of the book, while the unfolding of a new perspective on brain injury and clear explanations of the latest research mix throughout the balance of the 87 page text, (plus wonderful supplemental material in the form of notes, bibliography, and further reading suggestions). The Delaware Youth Concussion Summit, an initiative organized by the State Council for Persons with Disabilities Brain Injury Committee, Nemours/Alfred I. DuPont Hospital for Children, and the Brain Injury Association of Delaware, yesterday released its three-point Action Plan regarding the diagnosis, management, and return to activity for the rising number of young people sustaining concussions in sports activities. Participants in the summit and action work groups include leaders and experts in medicine, neuro-psychology, education, sports, advocacy, state agencies, and elected officials. The Summit aims to further the aims of Delaware’s concussion legislation, signed in August 2011, which mandated both concussion training for all DIAA coaches and awareness training for parents and athletes, and set some rules around written medical clearances before returning to play. On August 24th, 2009, our son Daniel made starting linebacker for Cypress Bay High School’s JV football team. It was a victory for him and his first major step in actualizing his desire to play in college. It was also his last day ever playing football. At 5’9”, 160 lbs. he wasn’t big, but he was tough and fearless, and he thought it was the way to be, to one day play for his dream team, the University of Miami Hurricanes. No pain, no gain. It’s been a bit over four years since Drew’s injury. Last night I was thinking holy crap; it was me against the world when I refused to let him return to the field. Honestly, there was no one on my side—not even my husband. Clearly, concussion awareness was in its infancy stage at that time. Back then, I rarely recall seeing any media coverage on concussions, and now I read at least 8-10 articles per day. I was flipping through the mail yesterday and came across a newsletter from Rush with an article about resting the brain after a concussion – how it is necessary to take at least 2 weeks off from school, etc. I cannot imagine what things would have been like if there had been even a smidge of academic support when Drew was hurt. Even more, I can only imagine what might have happened to him had I not dug my heels in and held firm about him not returning to football. Parents, you know your children better than anyone. If something doesn’t seem right, most likely it isn’t. Trust your gut – it costs nothing and generally holds value. Your child has one brain—the vital organ that runs his or her body. Protect it at any cost. Tracey is right, we have come a long way in a very short time, alas we are only scratching the surface on the issue. Kate Walsh (MdSBE Board Member): I think the Board’s interest here was to get at testimony before the Board in public comment. I think these are all great things that you have done, but there were three complaints that were raised that we thought were quite compelling, and we wanted to hear them addressed. And I don’t hear you really addressing any of them. So, can we go through this? What we heard was that there were regulations similar to those adopted by the Massachusetts Department of [Public] Health, have we done that? Have we adopted regulations that are similar to those? Ned Sparks (MdSDE Athletics, Executive Director/MPSSAA Executive Director): No. Again, those were regulations of the Department of Health in Massachusetts. Kate Walsh (MdSBE Board Member): So is that something you saying that we would not adopt be under another? Ned Sparks (MdSDE Athletics, Executive Director/MPSSAA Executive Director): I don’t know the regulations exactly how they are in Massachusetts but I would think that that would certainly be a combination of the Department of Health and the Education Department regarding that. [It sounds like, since the Mass DPH regulations were brought to the attention of the State Board in the parent’s May 22, 2012 testimony—five weeks earlier, Mr. Sparks had not yet reviewed the regulations.] Now, again, we had a representative on that group as you can see from the Department of Health and Mental Hygiene, as a matter of fact two of them. Renee Spence (Executive Director, MdSDE Office of Government Affairs): We work very closely with folks from the Department of Health and Mental Hygiene. Also, in Maryland, the Governor has put together a traumatic brain injury commission. There are a lot of folks working on traumatic brain injuries. I was asked to post this on The Concussion Blog, in full. I appreciate what another Parent Advocate is doing for raising the awareness of concussions. Katherine is doing a fine job and checking in on her is a must. 1. Educate yourself on the signs and symptoms of a concussion along with the other members of your family so that an educated adult is always available during a practice or a game or by phone for your child to call. Always check in with your child on the car ride home from any sporting activity or play date, and ask their day, and how they are feeling. If your child complains that he/she hit their head, you should know the correct questions to ask to see if there could be an issue with a head injury. 2. Educate your child about concussions. There are simple, painless videos for the media savvy teenager of today. Studies show that kids are more likely to report concussions when they know what a concussion is. The earlier the diagnosis, the sooner a child can begin the rest needed to heal a concussion. Tom Hearn, a parent advocate of Maryland provided initial testimony to the Montgomery County Board of Education earlier this spring. He had a further opportunity to provide testimony/information to the State Board of Education back on May 22nd. Due to that testimony (seen below) there has been a discussion item placed on the agenda for tomorrows regularly scheduled meeting. Good afternoon, Members of the Maryland State Board or Education and Acting Superintendent Sadusky. I am Tom Hearn and I am a parent of a student at Walt Whitman High School in Montgomery County, Maryland. 1. Adopt regulations similar to those adopted by the Massachusetts Department of Health for youth sports concussions; in Massachusetts, the Department of Health has gone through extensive notice and comment rulemaking procedures to develop workable policies and procedures to manage the risk to student athletes of sustaining sports concussions. The result is a set of state-of-the art best practices that are a suitable starting point for the State Board to align with those practices. 3. Reorganize responsibility for sports concussion safety away from the Maryland Public Secondary School Athletic Association, which currently has the lead, to a new department within the Department staffed by a lead public health professional or sports safety professional, such as a certified athletic trainer with experience managing sports health in a large school system, who reports directly to the State Board. It may not be highlighted in the job description, but collectively you are the senior safety officers for public high school sports in Maryland, and this may be the most important position that you play. In sports vernacular, collectively you are the Blind Side left tackle for the 15,500 students who play public high school football and the 100,000 or so other high school athletes. The quote in the title is a Japanese proverb, I have read it most recently in a very good book call “The Red Circle” by Brandon Webb; a biography of a Navy SEAL (you can learn a lot from these heroes). As with most proverbs you can take the meaning and apply it to whatever you want. In this case we are talking about concussions: awareness, education, assessment, recovery, treatment, etc. One thing that I hope comes through is that I do not feel that I am a “be-all-end-all” expert, rather I am a devoted husband and father that is an athletic trainer that chooses to spend time paying it forward – so to speak. I have been asked many times why this blog is here and there are many answers to said question but the underlying reason is simple: raise awareness and bring together all who care to create more understanding and better protection from this brain injury. The simple fact is that we have only just begun to really understand the concussion injury, each episode (aptly coined by Xenith) is unique; not only from age-group to age-group but from person to person. We know that males and females react differently, we know that youth and adolescent brains are much more susceptible to lingering effects than an adult brain, we know OR SHOULD KNOW there is no magic pill or course of action to prevent concussions other than living in a bubble, we know that there are very smart people out there with good ideas, we know that information can be controlled by many sources for many reasons, and we really should understand and know that the actual injury is not the elephant in the room, it is how it is handled from the beginning of the process. Concussions are a process not an event; as soon as the injury occurs what happens next is what shapes the individual brain for eternity, yes eternity. We have highlighted Advocates for Injured Athletes on here with the story of Tommy Mallon told through the eyes of his mother Beth. Not only are they continuing to fight for athletic trainers on the sidelines of every school they have come up with an initiative that makes too much sense – Athletes Saving Athletes. What is Athletes Saving Athletes™? Athletes Saving Athletes™ (ASA) is a +unique, peer-to-peer education program designed to empower student athletes with skills to help them recognize signs and symptoms of life-threatening injuries and conditions. The goal of ASA is to reduce the risk and incidence of injury and death for high school athletes using the power of kids talking to kids. Why is the ASA Program Needed? 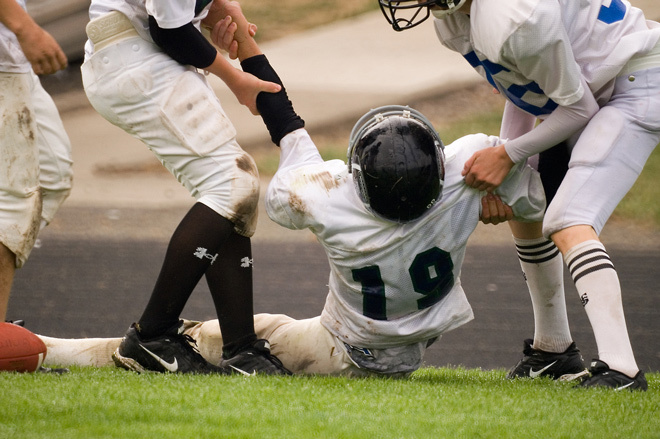 Every year, more than 1.4 million high school athletes in the U.S. suffer a traumatic or fatal injury. Most of these accidents are preventable. While some schools staff a certified athletic trainer, these personnel cannot be present at all the practices and competitions of every school sport. The ASA program provides student athletes basic knowledge and skills that could help save a life. Parent Advocate, Tracey Mayer will be offering up her writings to The Concussion Blog as a resource to the readers, especially the parents out there. As time allows she will be submitting posts for you to read. I truly hope that everyone gets a chance to read about concussions from yet another perspective. Thank you Tracey! My son, Drew, suffered a severe concussion during a freshman high school football game in September, 2008, and has not played football since. He would have stepped back on the field the next week and would still do so if he was allowed to. It was not his first concussion, but it was clearly the most severe. My earlier posts on here explain the details of what he has gone through. Clearly, he has made tremendous progress, but he still has some cognitive difficulties. He also suffers from migraines, which are typically provoked by intense focusing or from being hit on the head. It does not happen often, but there have been a handful of incidents over the past 2 years. Two weeks ago, he was elbowed in the head very hard during a basketball game, which resulted in a migraine with major fatigue that lasted for 4 days. Although Drew knows the university setting is challenging, I think he sees it as a fresh start. Now that he is 18, he will have to advocate for himself even more, so it is very important that he fully understands his disability and what his needs will be. The strategies that have worked for him in high school may or may not work in college. As The Concussion Blog enters into its second year of existence many have given their opinion of our work here; some negative but a great majority has been positive. Along with the critiques (always welcome) has come an urge for people to write and share experiences. This has mainly been accomplished in the comment section of the posts, but others like Michelle Trenum have given time to write and send information. 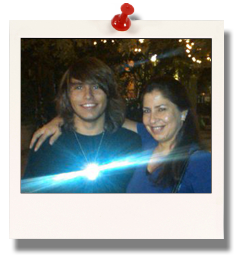 Today I would like to introduce another Parent Advocate, Tracey Mayer. She will be offering up her writings to The Concussion Blog as a resource to the readers, especially the parents out there. As time allows she (and possibly her son Drew) will be submitting posts for you to read. I truly hope that everyone gets a chance to read about concussions from yet another perspective. Thank you Tracey! TRACEY MAYER — Thursday, September 14, was the three-year mark from the date my son, Drew, sustained a concussion during a freshman high school football game. My heart was heavy that day, as it is to some extent every day, but I also felt energized on the anniversary; based upon all that has been accomplished in the areas of concussion awareness, education and research since his injury.